Belle & Blush's Merry Kline has beauty and skincare advice for moms on all points of the natural-to-glam spectrum. Merry Kline and sons Mick, 12, and Luke, 9. Merry Kline loves what she does — from the creativity she pours into her work to the clients she gets to interact with at Belle & Blush. While she may glam up for events and photoshoots, she knows that natural beauty shines brighter than any highlighter. As mom to Mick, 12, and Luke, 9, she doesn't always have much time to get ready. 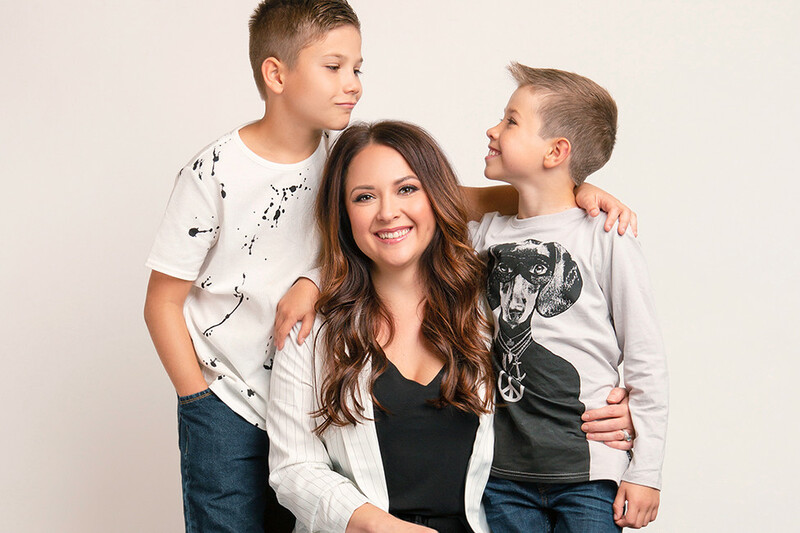 Here, she shares her beauty and skincare advice for moms on all points of the natural-to-glam spectrum. Where do you look for beauty inspiration? Professionally, I feel like a I get a lot of inspiration from my clients. Like, for example, if you came in and wanted me to help you with makeup and you said “I want my eyes to look more blue.” Creative problem solving for people and finding solutions for their everyday beauty needs is really fun and I feel like I learn a lot from that and get really inspired. How can a mom get better at hair and makeup? Don’t try and copy or mimic another person because then I don’t think you come off as natural. Go within yourself and always ask for professional help if you need it. We get asked questions all the time at the store about how to do things or what people should do. I think people who take the time to spend time with us are the happiest with their products and how it works into their life. What’s the best way to get out of a product rut? It depends on what your product rut is but typically I would just go play with new things. There’s a wealth of knowledge on YouTube and Instagram and it’s just never-ending information with makeup and skincare and hair products. Describe your go-to hair and makeup. I’m not full glam all the time. I like to do a lot of hair and makeup for events or photoshoots because I think it’s fun, but typically everyday I keep my makeup really natural. I’ll do really beautiful soft foundation and bronzer, highlighter, a little bit of blush and brows, mascara and a little bit of lip. Where are you favorite places to shop for yourself? I shop at Indigo all the time because they’re my store neighbor. I’ll also shop at Steamroller and Scarlet sometimes, and I also like Tulips. Every once in a while I like shopping on the Nordstrom app. Where are your favorite places to shop for your kids? I buy a lot of clothes from Target for my kids. With two boys, they tear everything up. I don’t like to get anything expensive because it’s all going to get torn apart. I will buy them better shoes — just Nikes or Adidas, some kind of tennis shoe. I have been buying some things from H&M and Dillard's because Mick is in cotillion and he’s been wearing suits. They actually have a wide selection there. When do you think a product is worth investing in? I think if it makes your life easier and simplifies things. I tell people all the time at Belle & Blush that if you’re going to invest, invest in your skincare first and then get a really nice foundation. You’ll feel good about yourself because your skin will look good and after that I love … good shoes and good handbags — things that are functional and make your life easier. 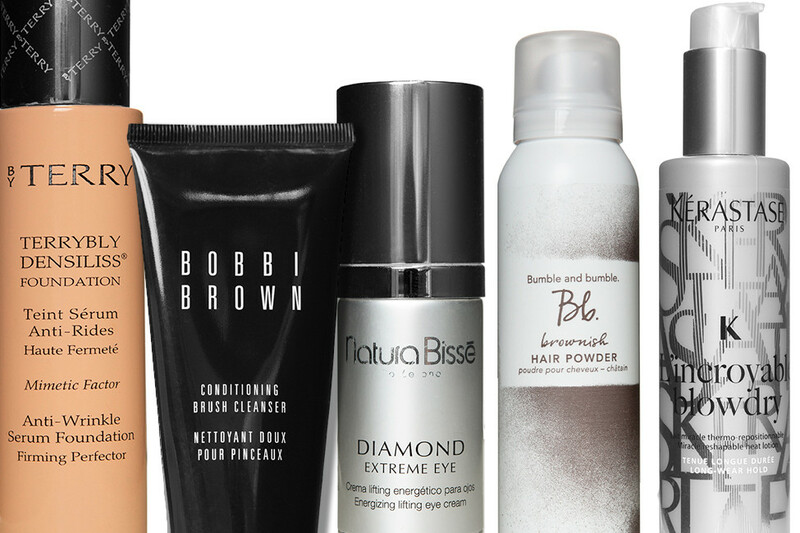 From left: Terrybly Densiliss foundation with serum built in, available at Belle & Blush; Bobbi Brown conditioning brush cleanser; Natura Bisse Diamond Extreme eye cream, available at Belle & Blush; Bumble and Bumble hair powder root coverup; Kérastase L'incroyable Blowdry Lotion for 72-hour flexible hold. See more of this month's Fashionable Families.